Since the first days of the festival, Bernard Hervet and Daniel Weissmann, supported by Aubert de Villaine, have decided to help young artists who have limited access to quality instruments. 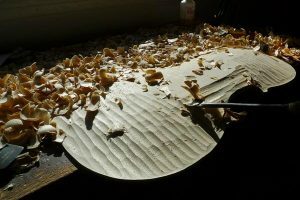 In order to create violins, violas, and cellos they have engaged internationally recognized luthiers, such as Stefan-Peter Greiner, Patrick Robin, Günter Siefert, Petr Sledaček, Antoine Gonon, Franck Ravatin, Apostol Kaloferov and Bernard Sabatier. From there they founded an instrumental fund which allows continued acquisition of instruments thanks to the generosity of its patrons and participating estates. This unparalleled initiative exalts the prestigious Burgundy vineyards with the fabrication of 33 string instruments – each bearing the name of a Grand Cru wine and each instrument bears its vintage label marked “Musique & Vin au Clos Vougeot“. Today the collection includes 20 violins, violas and cellos. It is also supplemented with instruments lent by private individuals. 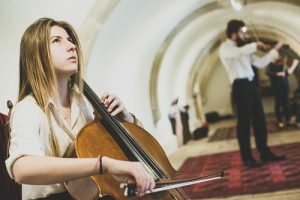 To select the young musicians who will benefit from the loan of a string instrument from the collection of the Fonds Instrumental, Musique & Vin au Clos Vougeot uses its vast network of partners and professionals. Daniel Weissmann, General Secretary of the festival and coordinator of the Fonds Instrumental, invites professional musicians for an audition, organized annually at the Couvent des Cordeliers in Beaune. The instrument lent to these young musicians, for a duration of one to three years, helps in their musical studies or at the start of their career. Many of the award winners have gone from the status of student to presenting themselves as candidates for the national conservatories in Paris and Lyon or to preparing for international selections. The next auditions will take place on April 2nd, 2019 from 9.30am to 6.30pm at the Couvent des Cordeliers in Beaune. Candidates, recruited by dossier selection, must present a program composed of an obligatory piece (cf application form) and a free piece (10 minutes max). 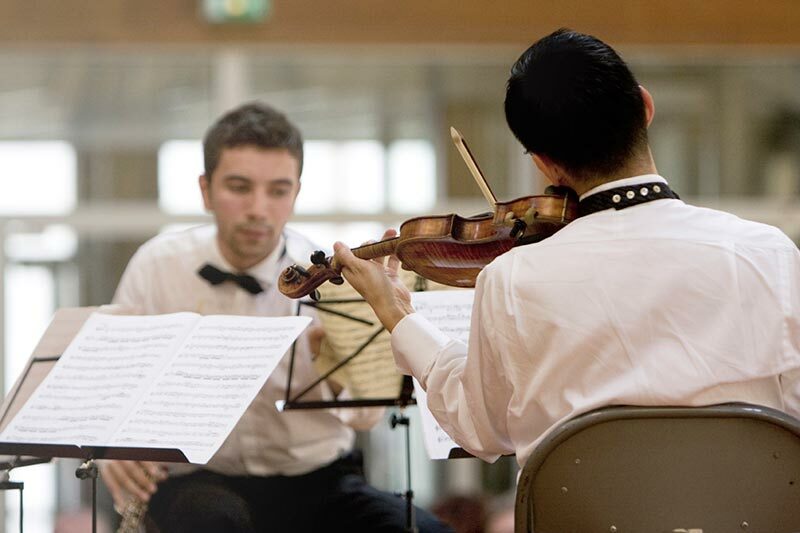 The Fonds Instrumental of Musique & Vin au Clos Vougeot is also supporting the “Orchestre des Quartiers“, initiated by the Dijon Bourgogne Orchestra in 2010. He commissioned and bought 12 violins and 11 cellos in 2009/2010, then participated financially in the purchase of 7 trumpets and 7 trombones. 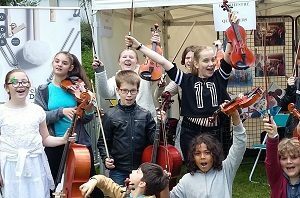 The “Orchestre des Quartiers” allows children between the ages of 8 and 12, from priority neighborhoods in Dijon Métropole, to learn for free a string or wind instrument. They have group lessons every week and orchestral sessions which result in 4 or 5 concerts a year. They can bring their instrument home in order to work. Children can participate in this project for up to 3 years and continue this learning, if they wish, with a specialized education (music school or conservatory). The “Young Talents” scholarship was created during the first edition of Musique & Vin au Clos Vougeot to help young musicians by awarding them a scholarship or by accompanying them in their professional debut (concerts, recordings etc.). Selected artists must be attending establishments or courses of higher education forming part of a recognized European and American cursus. 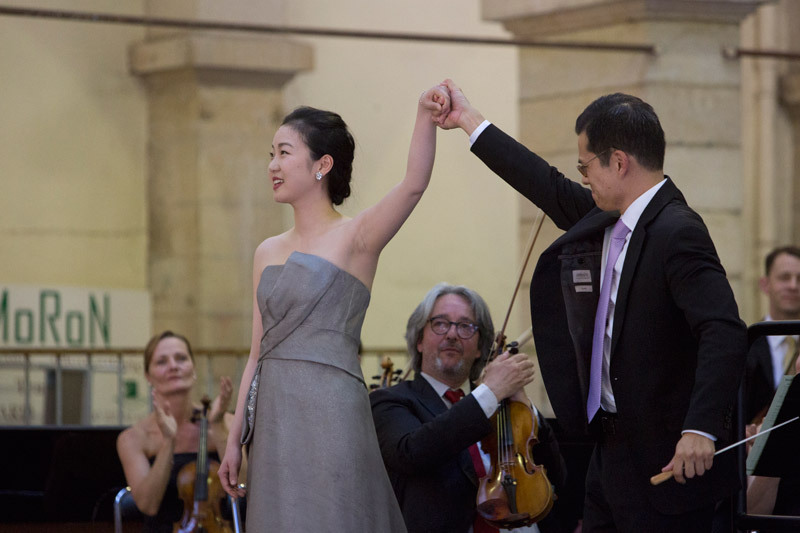 Fundraising by patrons and partners and financed by the annual auction held after the closing concert of the festival provides strong support to the award winners, allowing them to begin their international career with more serenity. With such a distinguished career start, the “Young Talents” are also engaged via this scholarship, to perform alongside great performers of international musical at concerts organized by Musique & Vin au Clos Vougeot. Each year, a free concert of the award winners and artists of the festival is given to the public in the mythical Grande Halle de Beaune (where the wine auction is held) thanks to its partnership with the city. The “Young Talents” of 2019 will be accompanied by the Dijon Bourgogne Orchestra led by David Chan during the concert of 22 June. This exceptional project has already dedicated 12 European instrumentalists and 10 American opera singers. Nicaraguan-American Soprano Gabriella Reyes is one of the most exciting emerging talents on the operatic stage today. Having just made her critically acclaimed house debut as the High Priestess in Aida, Gabriella will make two further appearances at the Metropolitan Opera in the 2018/19 season: First Lady in Die Zauberflöte and Nella in Gianni Schicchi. She will also return to the New York Choral Society for Tippet’s A Child of Our Time at Carnegie Hall. Highlights of last season include excerpts of Die Zauberflöte in concert with the Los Angeles Philharmonic, led by Maestro Gustavo Dudamel, and her debut with the New York Choral Society for Beethoven’s Symphony no. 9 with the New Haven Symphony Orchestra. Prior to arriving at the Met, she completed a training at Boston University’s Opera Institute where she sang several roles of Mozart, Gluck and actual composers such as Tobias Picker, Jonathan Dove and Philip Glass. In the summer of 2016, she debuted in OperaHub’s production of Montsalvatge’s El Gato con Botas and was selected by Houston Grand Opera to participate in their Young Artists Vocal Academy. She was a grand finalist in the 2017 Metropolitan Opera National Council Auditions and honoured by the Richard Tucker Music Foundation with a Sara Tucker Study Grant. Born in 1992, Caroline Sypniewski studied at the CRR (Conservatoire à Rayonnement Régional) of Toulouse and Paris before being admitted unanimously to the CNSM de Paris in the class of Jérôme Pernoo. 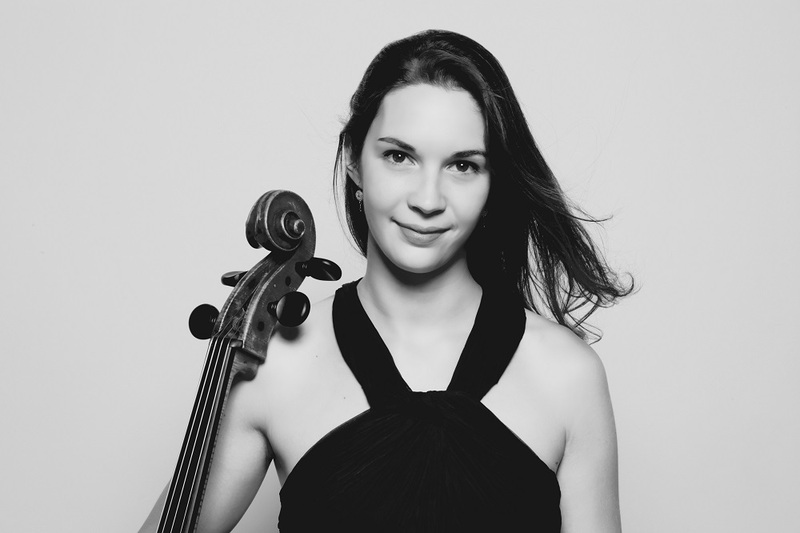 She is currently in Gautier Capuçon’s Class of Excellence at the Louis Vuitton Foundation and takes part in the Jaroussky Academy at the Seine Musicale. She is perfecting her playing in masterclasses with Gary Hoffman, Ivan Monighetti, Marc Coppey, Francois Salque, Wolfgang Boettcher, and Colin Carr. With a strong interest in chamber music, she has founded a string trio with her two sisters and participated in the Seiji Ozawa String Quartet Academy and the Paris Chamber Music Center. She performs in recital or in chamber music at many festivals in France. At the Carl Flesch Academy, she performed Dvorak’s Concerto and Haydn’s Concerto No. 1 with the Baden-Baden Philharmonic Orchestra. She plays with orchestras under the baton of great conductors such as Tugan Sokhiev, Hebert Bloomstedt, Myung Whun Chung, and Philippe Jordan. Caroline was Classical Revelation of the ADAMI 2017. She has a scholarship from the Safran Foundation and has won several prizes at the Maurice Ravel Academy and the Carl Flesch Academy. The Young Talents of the 2008 to 2017 editions are all following dazzling musical careers. Award winning singers have all been invited to the greatest international scenes such as the Metropolitan in New York, the Deutsche Opera in Berlin, the Paris Opera or Covent Garden in London. Some of the Young Talent instrumentalists, such as Pierre Génisson, Ismaël Margain and Pierre Fouchenneret, are now renowned soloists and sought-after partners in chamber music. Other instrumentalists have joined major European orchestras: Johannes Grosso is principal oboe of the Frankfurt Opera and the Bayreuth Festival, Mathilde Caldérini, the flute player, has joined the Orchestra of La Suisse Romande and Laura Jaillet, the first ever award winner of the festival, is now part of the European Union Youth Orchestra. The Trio Karénine has made a remarkable Schumann recording (with the Aparté label) thanks to the grant of Musique & Vin au Clos Vougeot, has won a lot of attention and performs regularly. After enjoying the closing concert of the festival, three hundred and fifty guests have the privilege of attending the gala dinner organized in the Chateau’s Great Hall (Le Grand Cellier). 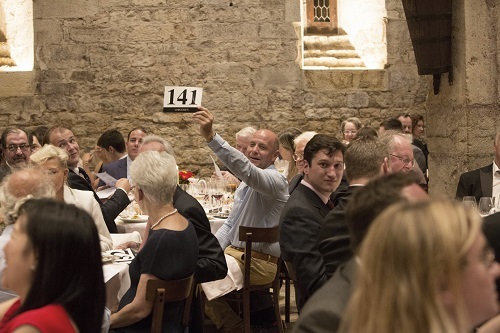 During this gastronomic tribute to the great wines of Burgundy there is the traditional auction of prestigious wines and works of art. All received monies are donated to the scholarship fund for Young Talents and the Fonds Instrumental. The auction is conducted by Anthony Hanson.